Get information about Annual Meeting CLE, events and more on the Annual Meeting site! Hear from great speakers, attend great events and share good times with great friends at this year's Annual Meeting. Registration includes a conference gift, Wednesday President’s Reception and Thursday Kim & Alan’s House Party social events, OBA hospitality refreshments daily and a 20% discount on registrants’ Annual Luncheon tickets. 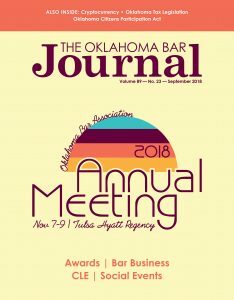 Plus, meeting registrants receive discounted registration on one or both CLE courses, this year focusing on the emerging issues related to medical marijuana and cyber security. Why should lawyers care about bitcoins2 and the lesser-known, but potentially far more important, blockchain in the news recently? There are numerous reasons but many are not yet known like Donald Rumsfeld’s unknown unknowns.3 Recall the internet decades ago when few envisioned Amazon, email, OSCN, Netflix, WikiLeaks, PACER, Google and the cloud. The following is a summary of some of the changes in Oklahoma law on state taxation enacted by the Oklahoma Legislature in the 2017 special sessions and 2018 session of the Legislature.